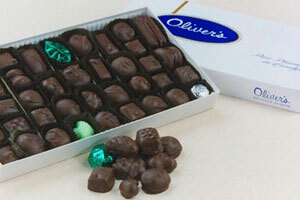 Let Oliver's help make your special event memorable with our party favors. Wedding, shower, birth, birthday, grand opening, anniversary, Bar mitzvah, Bat mitzvah, holiday and any other occasion you can think up! The following are available in milk chocolate, dark chocolate, white cote, yellow cote and pink cote. Also choice of ribbon colors. Foil Hearts (pink,silver,gold,red) $1.25 2pc. $1.75 4pc. $3.25 8pc. Sponge Candy (gold trim box) ~~~~~~~ ~~~~~~~~ $3.25 4pc. Foil Hearts (pink,silver,gold,red) $2.50 6pc. All of the boxes listed here can be personalized and customized. Add Curling Ribbon to any order ~~~ add 10 cents per box.